According to Mr Richard Wrangham, a professor of Biological Anthropology and researcher in Evolutionary Biology at Harvard University, cooking is what made us human! Forget the use of tools or the development of agriculture; it seems like it is the invention of cooking that led to the rise of humanity. ‘Cooking had an absolutely monstrous effect on us’ Mr Wrangham says in his interview with Edge. Also according to Mr Wrangham, the adoption of cooking had profound impacts on human families and relationships. Thanks to cooking there was no need to move from one food patch to another. It was not necessary to eat as you go anymore, you could accumulate the food and cook it when needed. And the effect of this was that food then became something that could be stolen. Males being bigger than females, it was easier for them to steal the food instead of bothering cooking it themselves. All this drove humans to form couples. The most efficient way to survive back then was for females to provide the cooked food and the males to provide security. In other words, the invention of cooking a million years ago is what led us to the birth of the traditional male-female household roles ! Back to nowadays. These are the results of a 2014 American survey. 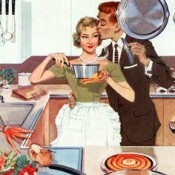 As you can see, it seems that women still spend more time cooking then men do. (Note : these numbers are comparable in other developed countries). 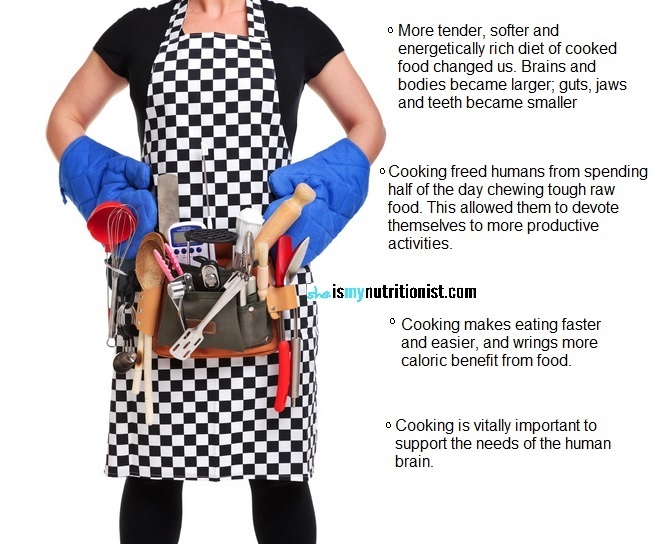 Women spend twice as much time preparing food then men. Approximately 20 minutes more per day. 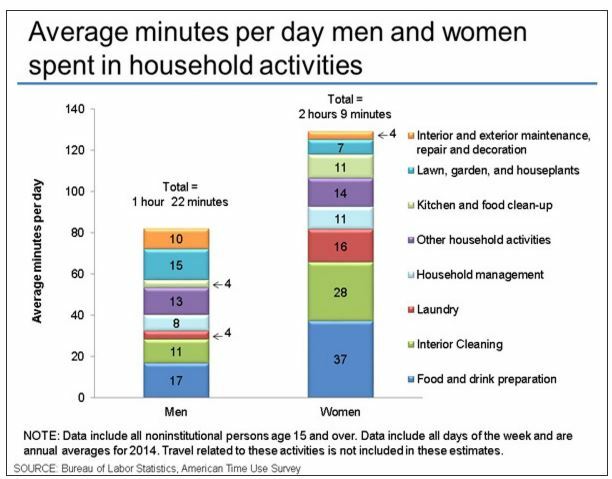 But compared to the 60’s, women spend half as much time (47.2 minutes/day less) preparing food. Men, on the other hand, had a small increase in their participation (+8.3 minutes). Spending less time cooking wasn’t necessarily a result of more efficient cooking methods or cooking tools. People spend less time cooking at home because they spend more time eating out or eating pre-pepared food. Part 3 : Cooking, why bother? 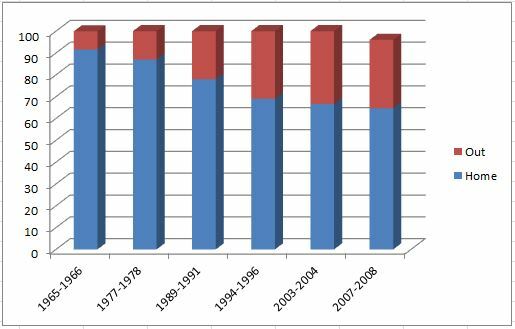 One of the results of these changes is that American diets have shifted towards decreased nutrient density. Less than 20 percent of Americans meet the USDA guidelines for a healthy diet, including fruits, vegetables, whole grains and low-fat dairy products. 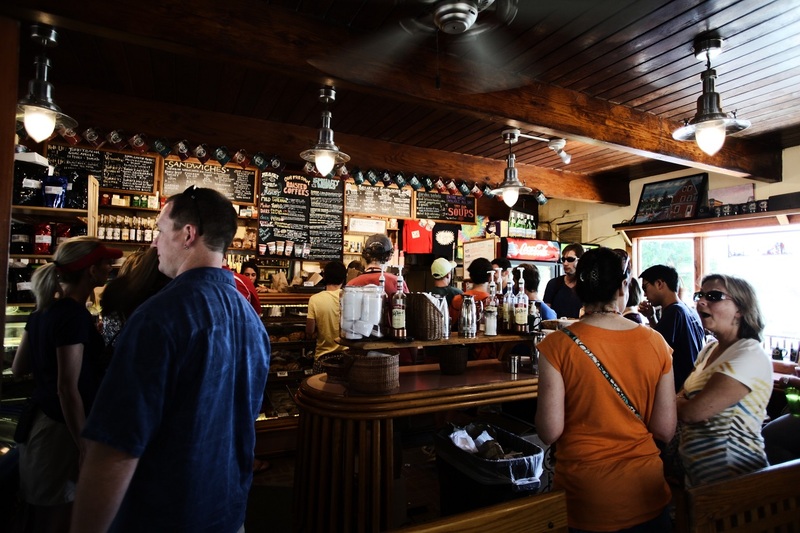 Unsurprisingly, lack of time is reported as a major barrier to preparing nutritious meals, prompting people to “buy” time through the purchase of convenience foods. Do you know what else happened in the 60’s ? Television became firmly entrenched as America’s new hearth. A Canadian: an average of 30 hours a week. Do you know how many home cooked nutritious meals you can cook with that time ? … A lot. One study shows that 28 % of americans do not know how to cook. Another one says that more than half of British adults only know how to cook up to 5 meals without consulting a recipe. Not knowing how to cook seems to be the second-most-cited reason for not cooking regularly. I asked this simple question to a few food bloggers : How did you get to love cooking ? What was your inspiration ? Was there an ‘aha’ moment ? ‘I learnt to cook from an early age, by cooking with my mother. She encouraged me to experiment in the kitchen, to work out ways to use up the produce from the garden and the markets, to use what we had on hand, and to be creative. My grandmothers were also skilled in home cooking, and my grandfather was an army Mess Sergeant, so I grew up surrounded by cooks. My mum is an amazing cook and I grew up surrounded by delicious food:home cooked dinners,juicy fruit and vegetables straight from the garden, freshly baked cakes.I had no interest in cooking at that time but I suppose watching my both parents passion for great food imprinted on me somehow. (…) Cooking is a constant learning experience and I absolutely love this beautiful journey,discovering new recipes,finding new ingredients,learning new methods and trying new flavours! Just like Whitney, Jo and Bea, studies have shown that up to 73 % of those who know how to cook learnt from their mother and\or their grandmother. But then again, not every child is invited into the kitchen to participate in the preparation of food. Read this : ‘I didn’t get my love of food from my mom’. HERE is the personal story of Michelle from thetiffinbox. In this article, Michelle says that she doesn’t blame her mother for not being passionate about food the way she is. So even though Michelle wasn’t invited in the kitchen as a child, it is still the memory of home cooked food from her childhood that triggered her love of cooking. If you are part of those who missed the opportunity to learn from your elders, this is not a fatality. Cooking is part of the circle of life. And a healthy life is only possible if we cook. Follow this link and take a quiz to see if you have basic cooking skills!